It's time for 2009 Holiday Card Mini-Sessions! Mini-sessions are casual 30 minute long photo shoots that take place in a local Atlanta-area park. They are the perfect opportunity to update your family photos and get some great shots for your 2009 cards. 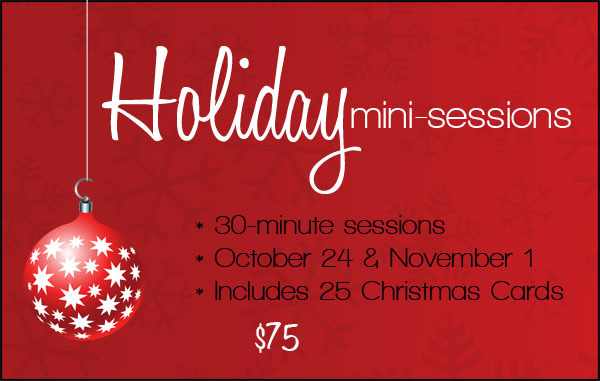 The session fee even includes 25 customized cards. Three sets of card designs are up on the blog so far and more will be added as we get closer to the date. Sessions will be held in the afternoon on Saturday, October 24 & Sunday, November 1. I announced the mini-session dates earlier this week in the monthly newsletter and on my Facebook page, so there are only 8 spots still open! Mini Sessions cost just $75. The fee includes your 30 minute session and 25 flat 5x5 or 5x7 customized cards. Email info@trueexpressionphoto.com for more details & to reserve your time slot!